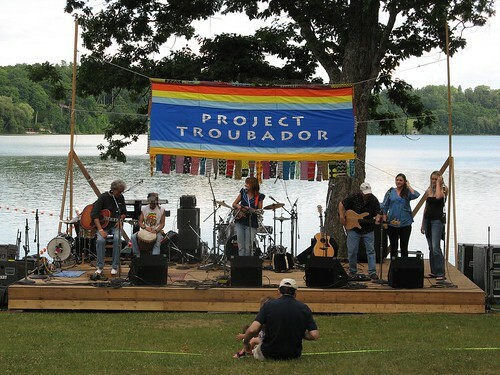 A great annual event, Project Troubador brings an interesting array of musical acts to the Grove at Lakeville. The funds raised support their work to bring global harmony through music -- as they write, "Project Troubador works to bridge cultural, racial and ethnic gaps while modernizing the ancient concept of the troubadour. By sending musicians, dancers and mimes to developing areas of the world, we strive to provide another view of America and Americans through performance and interaction with our audiences. By bringing our experiences back to American audiences, we work to raise the public's awareness of distant cultures and to illuminate new ways of integrating the "world family." We support that mission, plus it's a tremendous community event, very kid-friendly - we see everyone we know there! I took a bunch more pictures, here. Perfect...a great way to expose kids to music! I bet this is fantastic...what a wonderful idea.